Two nights ago, we were all hanging out on my bed. Natalie was reading us a story, Liam was checking out his new toy, Bill was listening to our daughter, and I was flipping through a magazine. I love quiet times together. It was very close to bedtime so I didn’t want to get the kids too excited or riled up. They wanted to wrestle with their father and I really didn’t want to get their hearts racing like that. So, I grabbed a piece of paper and made up a quick game. I wrote everyone’s name on a little sheet and folded them up. Then I had each family member pick out a name and say one good thing about that person. We did it three times to ensure that we each had a chance to speak about everyone else. The kids LOVED it and if I’m being honest – I LOVED IT too because I got to actually hear what the kids were thinking. 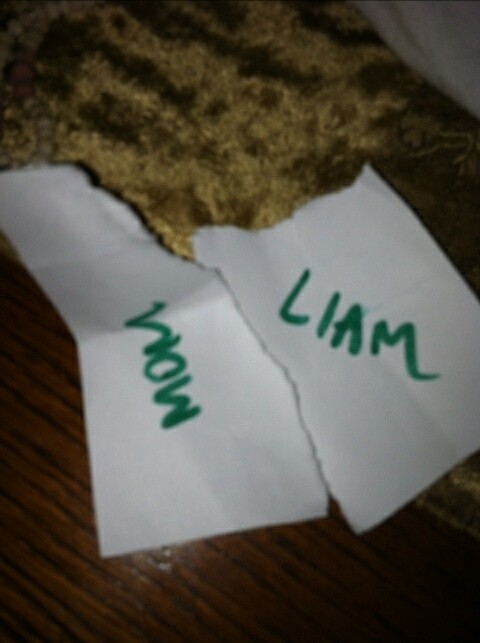 For instance, Liam said that he loved how much I kissed him. My heart melted instantly. It also gave Bill and me a chance to appreciate one another – and that’s something we typically don’t say out loud (after 10 years of marriage a lot of stuff is assumed). It was a very loving moment and I will be sure to remember to do it every now and then so we can all check back into this family. What a neat idea! It’s good to sit down and just get out what you are feeling every once in a while.